From what I read on the forum, it seems that HaplotypeCaller call variants (and perhaps calculates RGQ) using soft-clipped parts of the reads? Is there a parameter to suppress this behavior, making it throw out the soft-clipped proportions before calling? not sure if it's related. 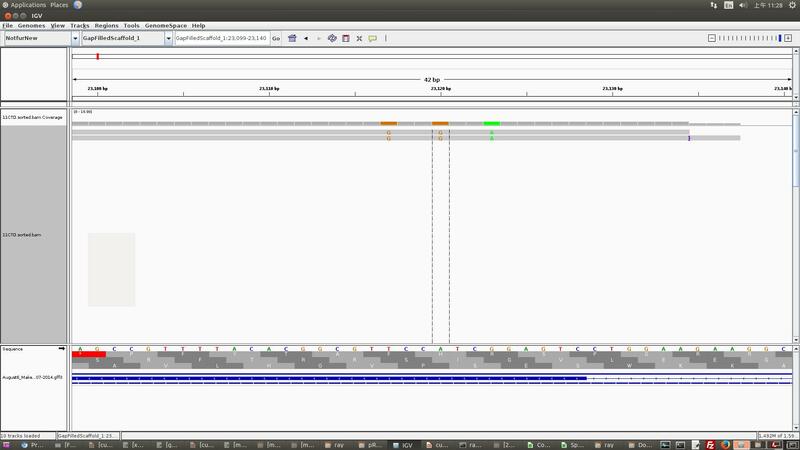 But in the vcf file, the marked snps have DP=1 while there seems to be 2 reads (both mapping Q > 30, both have soft clipped bases at the ends). The weird thing is that the bases around the 3 snps all have DP=2. 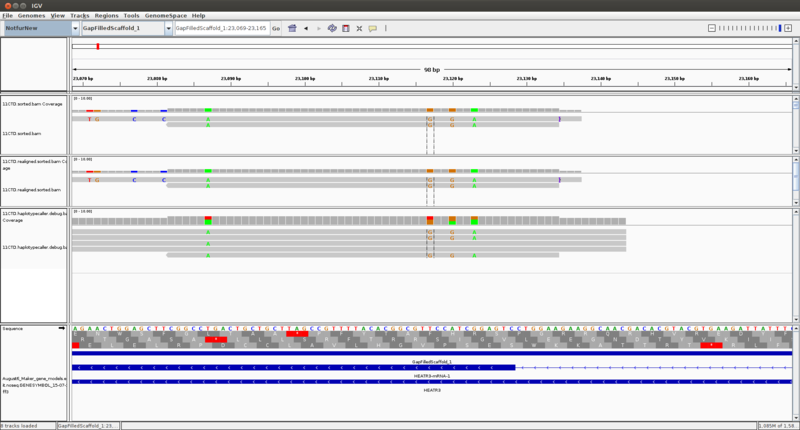 This is the vcf from GenotypeGVCF. Can you check the base qualities as well? I suspect one of the reads has a base that has a low base quality score. Thank you for the suggestion. However it seems that both base qualities are good, for example, the first snp "G" have 40 in one read and 37 in the other (I trimmed the data with quality > 25). One thing I notice is that the first read's mate is not mapped, does that make GATK to throw out both mates? But then it doesn't explain why in the non-SNP positions the depth is correctly given as 2. Hi Sheila, should I do CALLED_HAPLOTYPES or ALL_POSSIBLE_HAPLOTYPES? Ok, I'm running this now. But one note is that bam emission is not supported if I use -nct option, which wasn't what I used before, so not sure if results will be comparable. now that I'm looking at the bamout file, it doesn't seem to make much sense because HaplotypeCaller seemed to have reconstructed several artificial haplotypes in this region (5 in total), but somehow the output is still DP=2 for non invariant sites and DP=1 for the snps. Now I also notice that both of these two reads in the input bam have PG=MarkDuplicates. But Duplicate=no so probably that doesn't mean they were marked by Picard as PCR duplicates? I'm confident that PCR duplicate marking shouldn't be the problem because 1) the reads look quite different 2) This is a PCR-free library so by definition there shouldn't be any PCR duplicates 3) even if one read was thrown out due to PCR duplicate, the depth on non variant positions should also be 1, but currently it's 2. I think the 1 read is not being used because its mate is not mapped. 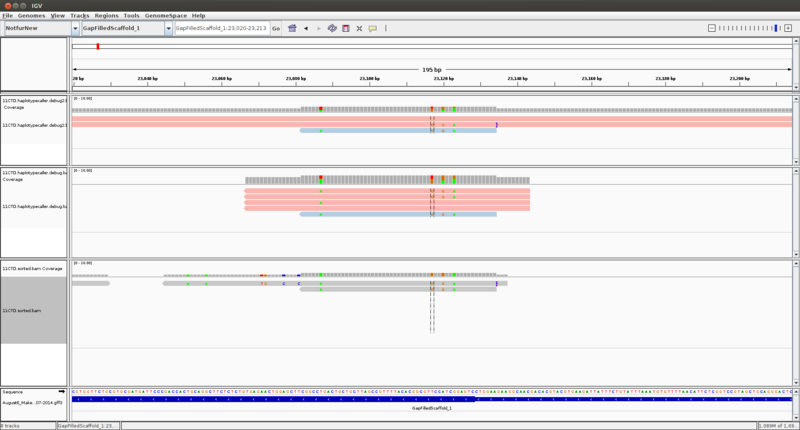 Haplotype Caller applies read filters, and reads that do not pass are not included in DP for variant sites. These Read Filters are automatically applied to the data by the Engine before processing by HaplotypeCaller. There are a few minor differences in how DP is calculated at variant vs nonvariant sites. And there are some reasons why individual reads will occasionally be discounted within HaplotypeCaller. Ultimately it is not always possible to have perfect accounting for every single read without delving deep into the HC's internal operations. This is typically not a problem when you gave sufficient coverage to make accurate calls. In this case you simply do not have enough coverage in any case, and I'm afraid we cannot devote any further resources to examining a call that would only be very uncertain at best given such low coverage. Dear Geraldine, thank you for the explanation. It's not uncommon for resequencing projects to use low coverage data (e.g. 1000 human genome, 3x-10x) in exchange for more samples, and depending on the type of analyses and methods involved, errors in the genotype calling can be tolerated as long as they do not introduce bias. Sometimes the benefit of increasing sample size outweights the disadvantage of errors in the call. On the other hand, please understand that I am not concerned about this particular call, but using this simple case to suggest inconsistencies in the behavior of GATK's HaplotypeCaller in the DP calculation. What I'm worried about is such behavior would also carry over to regions of higher coverage, without a well explained reason. I understand that resources are limited on your part to further investigate, but if you have more information on the HC operations I would be happy to take a look. Dear Sheila, thank you for your help, I will try this again tomorrow when I'm back in the office. Unfortunately adding these two parameters still gave the same DP calculations in the vcf. I can also post the bamout if you want. Yes, can you post the bamout? Please also color the reads by sample. It looks like in your original post, there is only 1 read. The other 4 are artificial haplotypes constructed by Haplotype Caller. Hi Sheila, now I notice that due to some reason HaplotypeCaller is not writing to the bamout any more. It creates the bam and the bai files, appending to the header, but doesn't write anything to them although there's vcf output. Perhaps bamout doesn't work with these two parameters? No.The bamout should work with those parameters. Em... now even if I remove the two parameters the bamout doesn't work any more... so far only seeing the header being written out, but nothing else. Do I need to wait till the end of the run to see things in the bamout? I remember that last time I ran it I saw output immediately... This is very strange. Yes, you should wait until the end of the run. Hi Sheila, attached is the new bamout (first track), the old bamout without the two added parameters (second track) and the original bam. So it does seem to have only 1 read in each case? Yes, the bamout only contains one read in the region. The other "reads" are the artificial haplotypes constructed by Haplotype Caller. I should have realized earlier what was going on! Sorry for dragging you through all this. Hi Sheila, yes - that part makes sense. But still I'm not certain why one of the reads was dropped since it appears to pass all the quality filters. It's also strange about the different DP's for invariant and variant sites. Since if only one "real" read is included then intuitively all sites should have DP=1. For now I have decided to proceed with the samtools protocol for SNP calling after indel realignment instead of haplotype callers, since at least it seems to produce DP estimates more faithful to the input data. Thank you very much for all the help. I just got some clarity from Laura, a developer here. I completely forgot that the GVCF contains the reference sites in blocks. The DP is usually not as accurate for reference sites, because there is only one DP for the entire block (median DP for all sites in block), which may contain many sites. The variant sites are accurate, because they contain single record for each of them in the GVCF. I hope this makes sense. Ultimately, it is up to you to decide whether you want exact read depths for all sites or accurate indel calls.